The SBNR website puts it like this: “Spiritual But Not Religious” describes a new worldview that is inclusive and open as opposed to separatist and closed. SBNR people desire a deep experience of life, including the mysteries of life, without the limitations and baggage of doctrine and religion. I don’t have to tell you how enormously popular such sites (and sentiments) are. I have recently (re)discovered how prevalent “Spiritual But Not Religious” devotees are on college campuses, even (especially?) church-related ones. Yet no matter the age group or demographic, this business of shedding the “baggage of doctrine and religion” is what it’s all about: snubbing dogma and its perceived strictures, rejecting all forms of religion, especially the organized kind. But I’m with Bill Cavanaugh on this one: “being against organized religion is like being against organized hospitals.” Institutions will always be subject to corruption and silliness, fraud and ineptitude, since they are comprised of people who . . . well, since they are comprised of people. But the organized, institutional part of religion – the messy materiality of people and practices – is its beating heart. Contra the breezy, anti-establishment tenets of SBNR (which are themselves pretty dogmatic), doctrine is simply the lived and living witness of a received tradition. The Christian doctrine of creation, for instance, is not a proposition to be believed in, a theory of how the world got its start way back when. Rather, it’s a way of seeing all things in relation to God; a way of receiving, offering, loving, and living one’s life as sheer gift. For the past few weeks, the Revised Common Lectionary’s epistle reading – The Letter to the Hebrews – has drawn us into the messy materiality of corporate religion: worship and prayer, gifts and offerings, cries, sighs, and tears. This week we are admonished to “provoke one another to love and good deeds, not neglecting to meet together.” That’s the inconvenient thing about religion: it asks you to do stuff – like worship with other people, love other people, do good to and for other people. And to do it all regardless of how you feel about any of it. To be spiritual but not religious, on the other hand, is to be unburdened by such stifling obligation. It is to turn inward instead of outward – to find, as the gospel according to Oprah puts it, “the god within.” This of course sounds like liberation – no commandments to obey, no debts to pay, no community to be responsible to. But it is, in the end, the worst sort of tyranny since the ruler and its subject are one and the same: the human ego. There’s a Facebook group called “I’m Religious But Not Spiritual.” Having joined it recently, I’ve noticed that it creates a good deal of bewilderment. Is it parody? Is it serious? Does it intend to confuse? The answers, from what I can tell, are yes, yes, and yes. To be “religious” in this world of obsessive spiritual questing is to be strange indeed. For Christians, it is to recognize that salvation – abundant life in the Spirit – is mediated through mundane realities like bread, water, and wine and through a body, Christ’s body, the Church. Find these posts helpful? Subscribe. I suppose that what I'm trying to get at here is how the word "spiritual" is now pretty much devoid of the kind of Christian content you rightly want to claim for it. Of course, the word "religion" has its problems, too. Both terms now function to name phenomena/experiences that are intensely private, therapeutic, consumeristic. 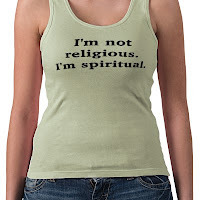 But the whole "Religious Not Spiritual" thing – even on Facebook – brings those bankruptcies to the fore, I think. There's something a bit tongue in cheek about it all, but the humor itself is a way into the strange places these terms and their uses have taken us. I'm all for the word "spiritual" if it can be recovered for what it actually refers to in the Christian tradition: a range of robust practices that communities engage in to bear witness to the upside-down kingdom of God. I find irony in this b/c in my studies in the discipline of nursing I look at incorporating “spiritual care” not “religious care” into nursing practice. Meaning caring for the whole person not just the disease, respecting the beliefs of my patients and what impacts those beliefs have on their health and care. I find people/patients/practitioners shy away from “religious” conversations b/c of their preconceived notions about dogma and conversion but rather identify with spirituality as it pertains to their believing in a higher power. But even in that there is confusion – I had a patient assessment that asked about a pt’s beliefs in general and received many answers stating their denomination not simply whether they believed in a higher power or what their faith was. (Granted it may have been how I worded the question). There is a lot to be gained by a spiritual assessment – much of which can also be attributed to organized religion such as participation in a place of worship, resources that can be found through the connections in that community or lack of any connections and what that means for a person. Although I may be misconstruing this I find it interesting how different disciplines can find different values in the same words. Thanks for complicating all of this – in a good way! Yes, "religious care" would be odd terminology in your field. I think that the dualisms we've inherited from the modern project make it hard for us to find the right language (let alone the best practices). I admire the emphasis in nursing on treating the whole person. (I've been reading Wendell Berry this week on this idea). Would that such a holistic approach was embraced by medicine generally. But "spiritual care" still sounds like a bit of an add-on to me. I don't have a better alternative. I just think that paying attention to the terms and their use can help us be clearer in our speech and our deeds. Thanks for this, Debra. I love the quote from Bill Cavanaugh – too true. I have been working with the Advent texts recently and Malachi 3: 1-4 leaps out at me with it's words of refining fire and fullers' soap. One of the greatest failures of modernity has been it's underestimation of evil. This would be one of my biggest concerns with the SBNR sites and attitudes. Would I be able to find words like I find in Malachi 3? I am grateful to be part of a religion that recognizes and addresses the sin in me and in the world. I find myself in agreement with Debra on the use of the term spiritual but for reasons that Bill Cavanaugh has expounded powerfully on in his recent book on The Myth of Religious Violence religion is deeply problematic. Back in the early church disciples could get away with simply being known as those who were followers of "the Way". Thanks so much for your insight! Great piece. Hope you're doing well – Adam English from Campbell University. Thanks to all for the responses. I would just reiterate, in response to Doug's comment, that I have no particular attachment to or investment in the word "religion." But in response to the "spiritual but not religious" phenomenon, it can be a useful trope, a way to recover the performative, densely embodied practices of Christian discipleship over against the flimsiness of the signifer "spiritual." I'm conflicted here. I have sympathy for what you say even as I believe that the Church in general has unrepentantly done a lot of damage to many people. I agree that a person can't just decide to opt out of community and then pretend to be on the moral high ground. But the church needs to do an awful lot better at nurturing authentic community and spirituality. Which is much better for you “being spiritual but not or slightly religious” or “being religious but not or slightly spiritual”?